MERIAN -India orientalis et insulae adiecentes. MERIAN, M. - India orientalis et insulae adiecentes. India orientalis et insulae adiecentes. 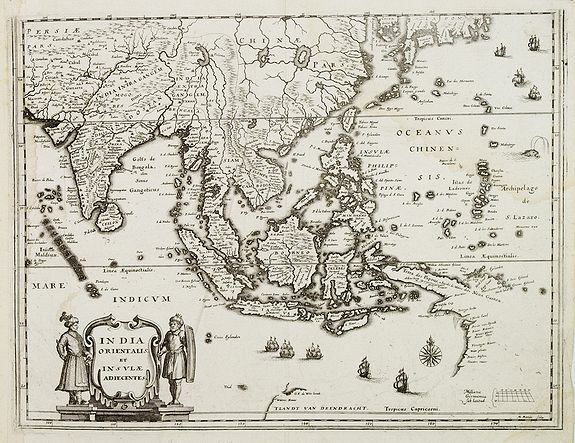 - MERIAN, M.
Title : India orientalis et insulae adiecentes..
Map maker : MERIAN, M.. Size : 10.5 x 13.9 inches. / 26.7 x 35.2 cm. Description :Mathias Merian's fine and decorative reduction of Blaeu's map of South East Asia. Condition : Paper very slightly age toned. Light water staining. Dark impression.